As the criminal justice system faces unprecedented cuts in the wake of the financial crisis, many members of the public fear for their safety. Criminals will face fewer police on the streets and a prison system that will struggle to contain convicts. But is an increase in crime inevitable? 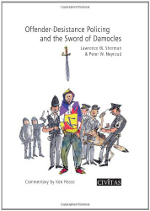 In this report, world-renowned criminologist Lawrence W. Sherman and former Chief Constable Peter W. Neyroud say ‘no’. They offer hope in the form of an efficient criminal justice strategy: Offender-Desistance Policing. This approach uses some of the latest crime control techniques to focus resources on encouraging individuals to desist from crime.